Understanding the legal requirements for any business is often a benchmark for organisations. Demonstrating environmental and sustainability compliance is key for any organisation, especially those which require third party certification for their ISO standards. How can we grow our businesses, innovate and create value without degrading our environment or harming society? Laws and regulations provide a cornerstone for protecting the environment and society from harm. Organisations have a legal and moral duty to comply with these laws and regulation but given the complexity of legal requirements regarding environmental and human rights protection, this is a significant challenge for them. Following the publication of the first edition in 2005, IEMA is now launching the second edition of its practitioner guide on Managing Compliance with Environmental & Human Rights Law in Organisations. The publication was developed in collaboration with Colleen Theron, Fellow Member of IEMA and Director of Ardea International, with significant editorial input from Marc Jourdan, IEMA Policy & Engagement Lead. The guide was developed by Colleen and Marc have with the involvement from over 100 IEMA members and leading professionals, following 4 workshop sessions and an extensive member survey. This is IEMA’s second edition, revised and fully updated with new case studies and surveys. This guidance is available free of charge to all IEMA members as a download and interactive publication and is also available to purchase as a book. The guide is also the second in the new Sustainability in Practice series of ‘how to’ books. 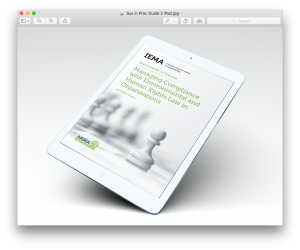 Managing Compliance with Environmental & Human Rights Law in Organisations is free to download for all IEMA members. It can also be purchased in hard copy – £15 for members from the Member Shop, or £25 for non-members here.